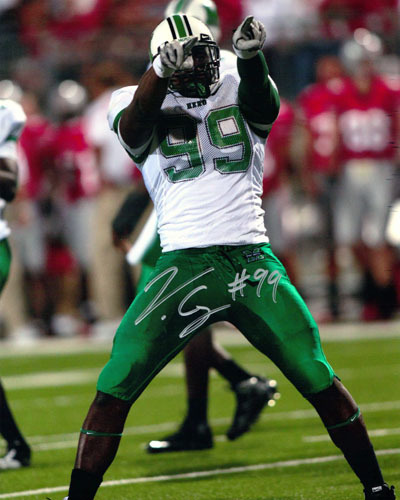 A HAND SIGNED VINNY CURRY MARSHALL THUNDERING HERD 8X10 PHOTOGRAPH. VINNY IS ONE OF THE MOST EXCITING DEFENSIVE PLAYERS OUT OF MARSHALL. THE PHOTO WAS SIGNED MARCH 1ST, 2012 IN DULTUH, GA AT A PRIVATE SIGNING WE HAD WITH HIM. THE AUTOGRAPH IS IN MINT CONDITION. THE PHOTO COMES WITH A SPORTS MIX CERTIFICATE OF AUTHENTICITY, SPORTS MIX HOLOGRAM, AND A PICTURE OF VINNY SIGNING.